Sure, now it may seem like every big chain (even the poultry-obsessed Chick-fil-a) has an either permanent or seasonal pescatarian-pleasing sandwich, but McDonald's was indisputably the trailblazer. Prepare to be enlightened on how the first fast seafood sandwich -- and, one of the 101 most influential dishes in American history -- was born, rejected, and ultimately resurrected. Sometimes strokes of sandwich genius can be attributed to divine intervention, but sometimes they're just a matter of desperate economic times necessitating some next-level creativity. It's 1962. The Kennedy presidency was alive and well. The Beatles' popularity was ascending overseas. And, more relevant to our story, Lou Groen, a Micky D's franchise owner in the greater Cincinnati area, was at the helm of a quickly sinking ship. Sales were brutal. His had a skeleton crew manning the place that consisted only of himself, his wife and some dude named George. "I did repairs, swept floors, you name it," Groen, who passed away at age 93 in 2011, told The Cincinnati Enquirer's Paul Clark in 2007. They were on the verge of losing it all, because no one was eating burgers on Fridays, especially during the months of February and March. The problem? The area his McDonald's served was almost 90% Catholic. And this ratio was bad news for meat-slingers, especially at this time. "Good Catholics" were "expected" to abstain from meat every Friday, and many would completely take meat off their menus during the entire 40-day period of Lent. Ask your grandma. Or, my grandma. Or any older person wearing a crucifix and silently scolding you with their retinas. The laws passed by the Vatican in the late '50s and early '60s made it easier to get your penance in other ways (like giving random stuff up in place of meat). But at the time when Groen's business was in the toilet, most self-respecting Catholics still followed these meat-restricting guidelines like it was the Word of God. Which to them, it was, of course. 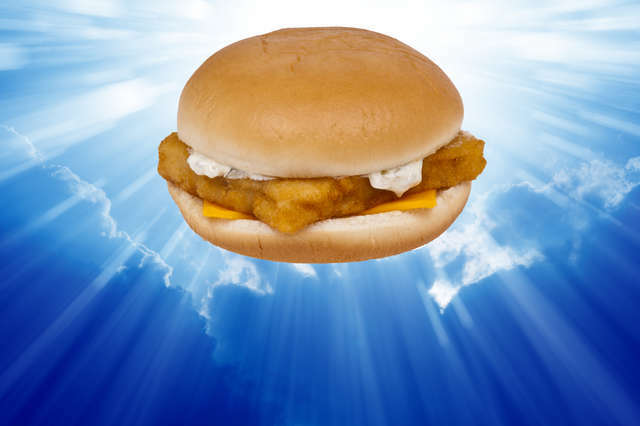 And on the third day, Groen created the Filet-O-Fish. And it was good. Not only did Groen have the almost saintlike intuition to buy a McDonald's franchise in the early '60s, but he also realized the company was getting screwed out of some serious bucks during the sacred stretch when Catholic customers ditched the golden arches for fried fish joints -- Groen noted that the nearby Big Boy was doing gangbusters business with its version of the fish sandwich. 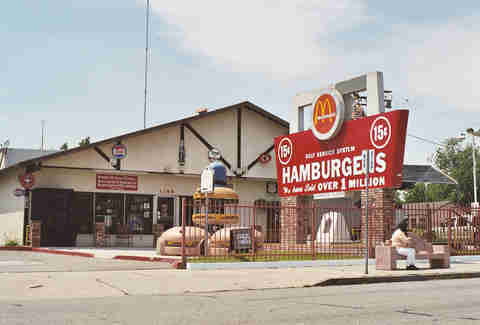 So, he hatched a fish sandwich concept of his own that would fit with McDonald's fast food ethos, whipped up some tartar sauce, and took his experiment to Micky D's headquarters for an evaluation, and hopefully the go-ahead from corporate. The brass at McDonald's couldn't deny that Groen's fish-wich was a solid idea, but they were already conceptualizing ideas for a meatless sandwich, too -- because if there's one thing upper-management excels at, it's crushing the dreams of their employees (excluding my bosses, of course). Don't freak out, but the Filet-O-Fish was almost nixed for the "Hula Burger"
Groen said that McDonald's head honcho, Ray Croc, envisioned their meatless sandwich as a cold bun with a slice of pineapple and cheese on it. And he wanted to call it the (**shudder**) "Hula Burger." Seriously. "Ray said to me, 'Well, Lou, I'm going to put your fish sandwich on (a menu) for a Friday. But I'm going to put my special sandwich on, too. Whichever sells the most, that's the one we'll go with.' Friday came and the word came out. I won hands down. I sold 350 fish sandwiches that day. Ray never did tell me how his sandwich did," Groen said. People prefer warm cuts of fried fish to cold slices of pineapple? What marketing department could have possibly seen that coming?! Though to be fair pineapple seems to have beat fish out in terms of popularity as a pizza topping (even if not everyone is on board). 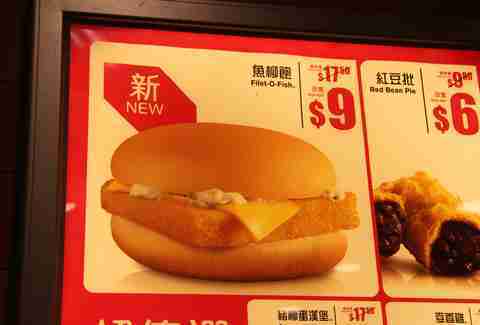 The Filet-O-Fish represented the first major expansion of McDonald's original menu, and has since become a staple of Micky D's menus around the globe, inspiring plenty of fast-food copycats. And on a micro-note, in Groen's words, it "saved his business." While the man himself is no longer around to revel in the glory of his creation, his contribution to the world of fast food swims upstream eternally. According to the original Cincinnati Enquirer profile, 23% of all Filet-O-Fish sandwiches are bought during Lent, and its religious significance has extended beyond Catholicism, as Muslims and Jews -- who also have dietary restrictions regarding meat -- have embraced it as well. So the next time your Catholic guilt overwhelms you, and you opt for the Filet at the drive-thru on a Lenten Friday, thank Lou Groen and his spark of marketing genius. But remember, not even a McGangBang is worth 4,000 Hail Marys. Wil Fulton is a staff writer for Thrillist. He also went to Long John Silver's during Lent. Follow him: @wilfulton.